An ancient fruit and arguably the most popular in many parts of the world, mangos are in the same family of plants as pistachios and cashews, which are also tropical, fruit-bearing trees that can grow up to 100 feet in height. 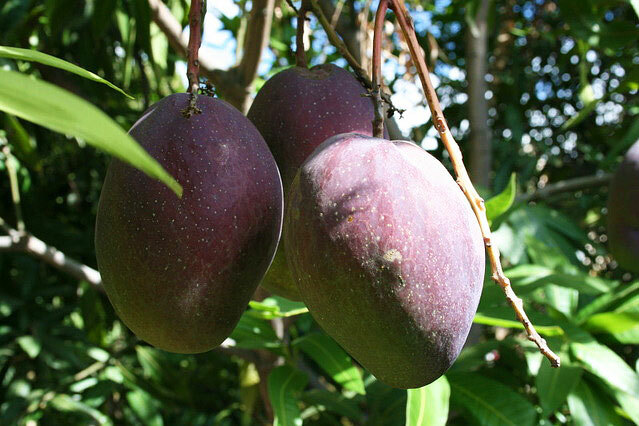 Oval in shape and around five inches long, mangos are heavy because of the single, large seed or stone in the middle, which makes them a drupe. 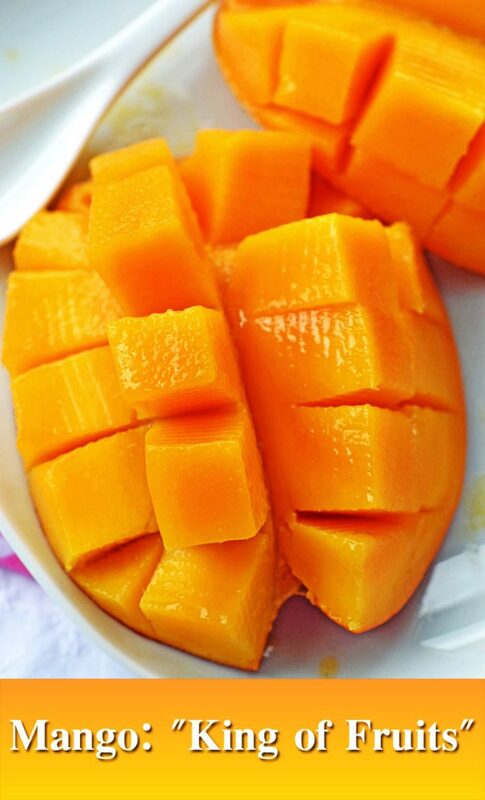 Mangos have a yellow-golden tone when ripe, sometimes with patches of green. The fruit surrounding the seed is succulently sweet, fresh, and juicy with just the right touch of tartness. 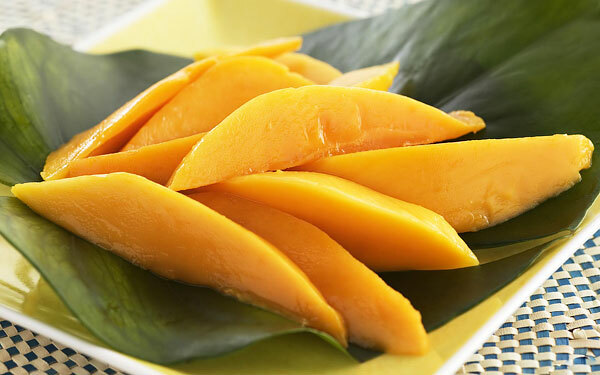 Their natural tenderizing properties make mangos a great ingredient for marinades for any type of meat. Mangos were first cultivated in India several centuries ago. Most mangos consumed in the U.S. are produced in Mexico, Ecuador, Peru, Brazil, Guatemala, and Haiti. The best way to choose a mango at the store is not as much about the color as it is its firmness. Push gently against the skin with your thumb. If it’s “squishy,” it’s too ripe; too hard and it’s not yet done. It’s perfect when it gives ever so slightly to gentle pressure, and may also have a fruity aroma on the stem end. If unripe, you’ll want to keep it at room temperature – not refrigerated – so it can become not just softer, but also sweeter. 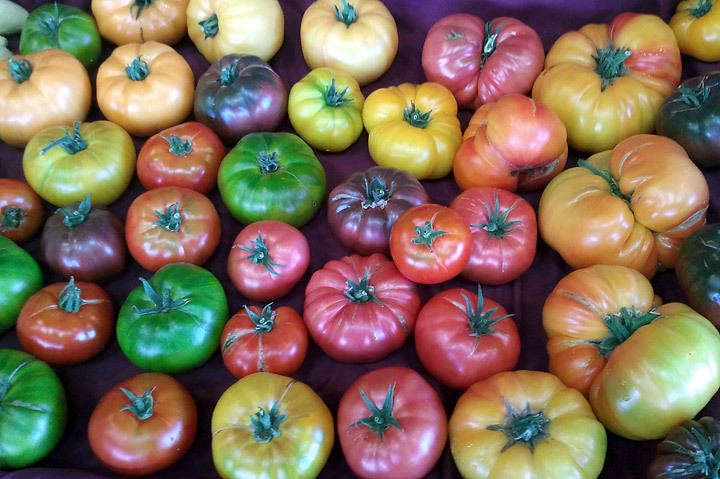 To speed up the ripening process, place it in a brown paper bag for a few days, checking at regular intervals. Refrigerate mangos when they’re at optimum stage of “doneness.” Uncut, they can keep for around five days. Peeled and chopped, they’ll be fine in the freezer in an airtight container for six months or so. Besides having more than 20 different vitamins and minerals, mangos contain flavonoids like betacarotene, alphacarotene, and beta-cryptoxanthin, which help vitamin A to impart antioxidant strength and vision-protecting properties, maintaining healthy mucous membranes and skin. Consumption of natural fruits rich in carotenes, like mangos, is known to help protect the body from lung and oral cavity cancers. The potassium in mangos is an important cell and body fluid component to help control your heart rate and blood pressure. Vitamin B6 (pyridoxine) is required for GABA (an inhibitory neurotransmitter) hormone production within your brain. It also controls homocysteine levels within your blood, which may be harmful to your blood vessels and may cause stroke. Required for the production of red blood cells, copper is a co-factor for many vital enzymes, including cytochrome c oxidase and superoxide dismutase. One cup of mangos provide 12% of your daily dietary fiber, which not only helps keep your system running smoothly, but also shortens the time waste spends in your colon, reducing the risk of colon cancer. In fact, mangos have been shown in clinical studies to protect against cancer of the colon, breast, and prostate, as well as leukemia. Several trial studies suggest that polyphenolic antioxidant compounds in mangos are known to offer protection against breast and colon cancers. Scientists tested mangos and found they prevent or stop certain colon and breast cancer cells in lab studies. 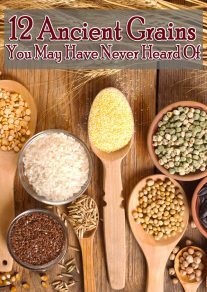 They also showed some impact on lung, leukemia, and prostate cancers, but the most prominent effectiveness was against breast and colon cancer lines, which underwent apoptosis, or programmed cell death, and the mango polyphenolics did not harm normal cells. According to the report, although other foods contain more antioxidants, mangos can still be considered a super food for this reason. Puree mango, vinegar, honey, and ginger in a blender or food processor, and then set aside. Preheat oven to 400°F and spray a large baking sheet with non-stick cooking spray. Rinse shrimp and pat between paper towels until dry. In a medium bowl, stir together honey, soy sauce and chili oil. Dip shrimp in mixture then roll in coconut, pressing so that it sticks to the shrimp; place on baking sheet and sprinkle with some of the excess coconut. 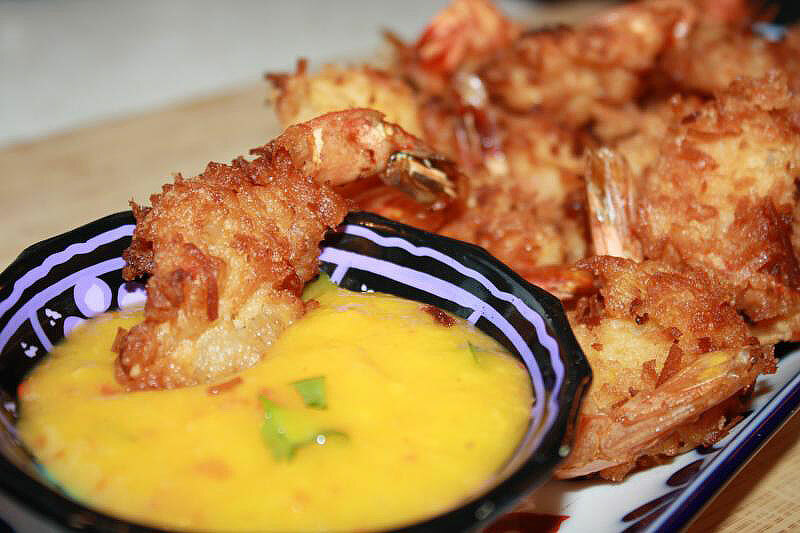 Bake for 6 to 8 minutes or until shrimp is firm and coconut is golden brown. Carefully remove from baking sheet with a spatula, and transfer to a platter. Serve mango sauce on the side for dipping. Makes four main dish, or eight appetizer servings. The paisley pattern, made popular in India, was an inspiration from the shape of a mango. Mangos originate 4,000 years ago in the sub-Himalayan plains. Luscious and juicy, and with more than 20 different vitamins and minerals – what’s not to like about mangos? Having originated in India 5,000 years ago, this tropical fruit is now cultivated in South and Central America, the Caribbean Islands, and other warm areas of the world. 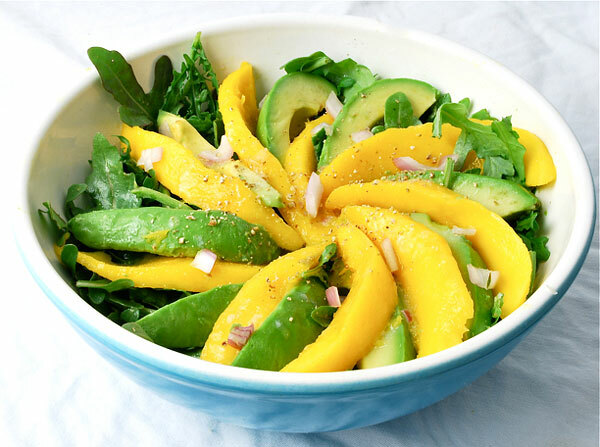 Mangos are a wonderful addition to salads, along with other fruits such as mandarin oranges, grapes, apples, and pineapples. Impressive amounts of vitamin C, vitamin A, and flavonoids like betacarotene, alphacarotene and beta-cryptoxanthin in mangos help provide benefits, such as healthy immune function, normal blood pressure, good vision and strong bones, plus added protection from lung, mouth, colon, breast and prostate cancers, leukemia, and stroke. 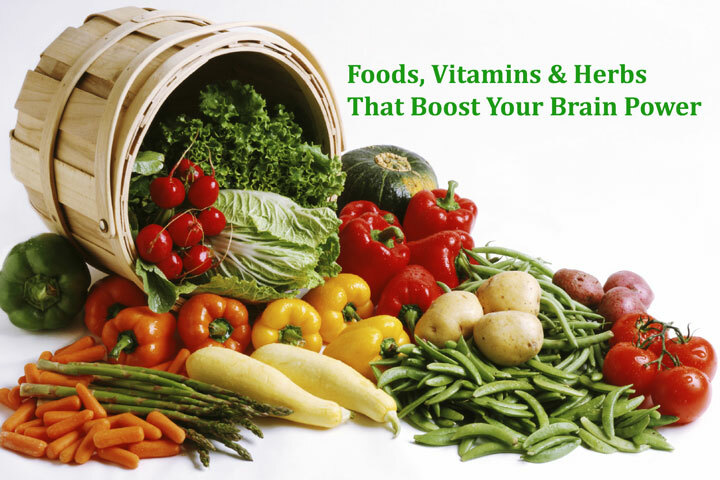 Vitamin B6 (pyridoxine) produces hormones in your brain. Mangos can be made into a delicious sauce for meats, which is just one recipe among hundreds that place this exotic fruit on your table for benefits far beyond good taste. However, consume mangos in moderation because they contain fructose, which may be harmful to your health in excessive amounts.